Why there is no such thing as true "Evil". 1. Morally bad or wrong; wicked: an evil tyrant. 2. Causing ruin, injury, or pain; harmful: the evil effects of a poor diet. 3. Characterized by or indicating future misfortune; ominous: evil omens. 4. Bad or blameworthy by report; infamous: an evil reputation. 5. Characterized by anger or spite; malicious: an evil temper. 1. The quality of being morally bad or wrong; wickedness. 2. That which causes harm, misfortune, or destruction: a leader's power to do both good and evil. I start this blog post with a definition because evil can mean different things in different contexts. While I will confine myself to the definitions that apply to writing, it still covers quite a bit of ground. I decided to jot down some thoughts on it because I have been thinking of ways to improve my antagonists, the ways they differ, the traits they share, and the ways that their justify their motives. 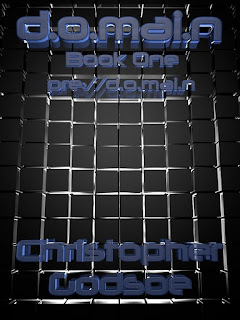 In the first two novels of my d.o.mai.n series I have created two very different antagonists. In "pre://d.o.mai.n/theSagaof/MilesTorvalds", the antagonist is the collective hierarchy of banks, government, and corporations that Miles believes to have severely compromised the health of his mother and the free will of the populace for the sake of power and financial gain. In "d.o.mai.n", the plot revolves around discovering the identity of the "bad guy", the thief that is using the d.o.mai.n system to bypass the security and steal millions from those same corporations and banks. We are led to believe that it is not our protagonist Theo Atkins, and as such we are led to suspect everyone else. Our eyes aren't lifted from Theo often over the course of the novel, so if he is pulling the strings of the heist and planting evidence to implicate himself, he truly is an idiot savant. I've come to realize that the secret to writing a convincing antagonist comes down to "justifying their sins". Having a purely evil character may work in fairy tales, but when a measure of reality is expected, the storyteller had best have a convincing argument ready to justify unscrupulous behavior, even if it doesn't make sense to anyone except said evil-doer. It has been said that all villains are driven to their deeds by the pursuit of one of the seven deadly sins. Lust, Sloth, Greed, Wrath, Pride, Envy, and Gluttony. No doubt you have come across your share of many of these in your reading as well as in your life. As it is in reality, it is on the page. I have a common misconception to combat here-aside from within the mind of the unimaginative storyteller, true "evil" is a fallacy. You heard me, it doesn't exist, or at least it's existence requires an ethereal set of societal norms to be measured against. Norms that will differ depending on setting and time. So, despite the valiant effort above, any definition of evil is supplied by the majority, and the classical definition of "evil" will never be carved in stone and always open to interpretation. What most people consider "evil", is actually weakness. "Evil" characters know right from wrong. If they are developmentally incapable of knowing right from wrong, they aren't evil, they are handicapped. While traditionally evil characters have "weaknesses", they are typically of the moral variety, not the genetic or physical. They know right from wrong, they simply do not choose to play by the rules because their "sin" of choice has supplanted their need to adhere to societal norms. If you are thinking that "evil" antagonists sound a lot like sociopaths, I wouldn't begrudge you that point, although I think that's an oversimplification. Some villains, particularly of the malicious Head Cheerleader type, are actually overly sensitive about societal perceptions. They are very finely focused on the way they are perceived, and are driven to not only fit in, but to be admired above all others. Their sin, Pride, becomes all consuming to the point that they are willing to put their self image ahead of others at nearly every turn. The seven deadly sins are essentially, in my eyes, different flavors of selfishness. If you think about it, each of the seven basically come down to the sinner thinking that they deserve something more than someone else. Take my examples above. My two antagonists, the Invisible Thief of d.o.mai.n, and the omnipresent entities of pre.d.o.mai.n, both believe that they are entitled to money that they did not earn. They succumb to Greed, but their first mistake was that of selfishness. So, if you want to break it down to it's inception, maybe all antagonists simply weren't taught to share as children. So writing a convincing, interesting antagonist (or "bad guy") isn't about creating the most sadistic mass murderer your mind can create, it's in taking your hero, and tweaking his motivations. I think it's a worthwhile exercise to take the hero from one of my stories, his personality and character, and twist it by changing only his motivations. Take your pillar of virtue, your cool, calculating spy, and give them a childhood that teaches them to throw their morals out the window in pursuit of the singular thing that they have been denied their entire life. Because when I see adults that are immoral, there is always a reason. It's the butterfly effect of our world. A father that continually degrades his children because he is unhappy with himself teaches his children that they themselves are unworthy of happiness. At some point one of the children will seek to fill that hole with something, and...........take your pick of the seven deadly sins, as you are the author of their downfall. For the purposes of this exercise, let's say that they decide that physical abuse is the way that they choose to recover their lost self esteem. The person that they abuse will continue to carry the cancer of the previous persons selfishness, choosing their own personal flavor of sin to carry the torch until someone at some point introduces kindness and./or morality into the chain. By definition, you cannot have catharsis or redemption without having a ditch to pull your character out of, and creating at least a rudimentary back story to justify your antagonists ill intentions. A human antagonist, or at least one with human weaknesses, makes for a much more interesting conflict. So, when it comes time to create your "evil" villain, don't cheat them. Give them as much thought as you give your hero. You story will be much more interesting when you have to make your hero struggle and bleed for his happy ending. I look forward to your comments, I certainly don't know everything on this or any other subject, and wrote this just as much as a helpful exercise for myself and to start a discussion as I did to instruct anyone. Once again, thanks for reading, and I hope you take a look at some of my earlier posts. The "Bad Guy" is always the more interesting character, and usually funnier. I see your point about re-defining evil but some people do some things that are so heinous (for whatever reason) that we have to think they are evil. Trying to give them a back story is interesting, but may lose the audience if what they do is just that terrible. Sometimes we don't want to know their story. My book actually has what I consider a very likable bad guy, but that depends on how you interpret the story. Thanks for the comment. I didn't mean that they HAD to be likeable, just that if you take the time to flesh out their reasoning (even if you don't agree with their view), it makes them more believeable. I've just become disenfranchised with the classic "run around doing bad things because its good to be bad or because they were just born bad". There are plotlines where it works perfectly (especially if it is being leveraged for satirical effect ;-), I just feel that its often a loophole employed out of laziness or lack of creativity.